Horst Bischof received his M.S. and Ph.D. degree in computer science from the Vienna University of Technology in 1990 and 1993. In 1998 he got his Habilitation (venia docendi) for applied computer science. Currently he is Vice Rector for Research at Graz University of Technology and Professor at the Institute for Computer Graphics and Vision at the Graz University of Technology, Austria. 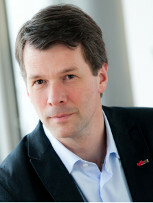 H. Bischof is a member of the scientific board of Joanneum Research. His research interests include object recognition, visual learning, on-line and life-long learning, motion and tracking, visual surveillance and biometrics and medical computer vision where he has published more than 750 peer reviewed scientific papers. Horst Bischof was General Chair of CVPR 2015 and ECCV2018. He was program co-chair of ECCV2006 and ECCV 2020. He is multiple times Area chair of all major vision conferences. He was Associate Editor for IEEE Trans. on Pattern Analysis and Machine Intelligence, Pattern Recognition, Computer and Informatics and the Journal of Universal Computer Science. Horst Bischof is member of the European academy of sciences and has received several awards >20 among them the Most Influential Paper over the Decade Award from MVA 2019, the Jan Konderink award at ECCV 2018 and the 29th Pattern Recognition award in 2002, the main price of the German Association for Pattern Recognition DAGM in 2007 and 2012, the Best scientific paper award at the BMCV 2007, the BMVC best demo award 2012 and the Best scientific paper awards at the ICPR 2008, ICPR2010, PCV 2010, AAPR2010 and ACCV 2012.